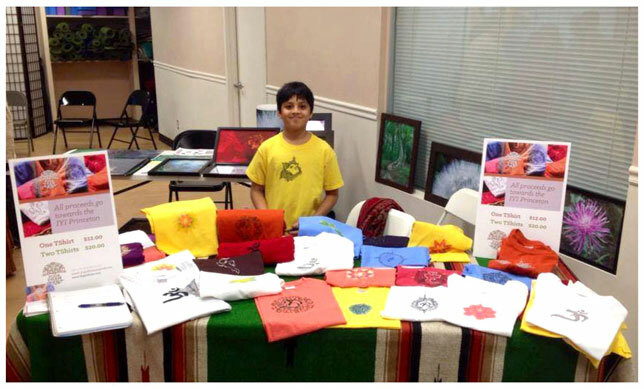 It all began, in the preparation for the Integral Yoga Institute, Princeton (IYI) fundraiser on December 13, 2014. A yoga institute so very close to my heart, the place that taught me so much, the change I feel is beyond a reasoning or any kind of explanation. IYI, being a not-for-profit institute, I wanted to give back, give back in the way I could- by painting, or by creating. I decided to paint on Tee Shirts to raise money for a community fair at the Institute. I hand-painted a variety of art on Tee Shirts like OMs, Ganesha’s, Lotus, Durga, incarnations of Vishnu and Sanskrit verses. The response for the Tee’s was heart warming and I sold more than expected for the fundraiser. A few things that took my breath away was the response we got after the sales, on how the people felt as they wore the shirts. Icons of the OM, Ganesha, Lotus reminded them to be aware of themselves and the actions they performed every time they wore the shirt. This feedback was very personal to us and this is our key motivation-creating products that envoke’s ones awareness and their sense of well being. Please check out our Giving Back Page for IYI Princeton.